What’s included with my rental RV? Each rental includes insurance and unlimited use of the generator free of charge. We also supply you with a trashcan, trash bag, broom, and a dustpan. What are the differences between Gold, Silver, Bronze, and Copper motor homes? Gold includes 2017-2019 model units with larger capacity tanks, upgraded flooring, cab over windows, TV/DVD combo and mp3 player connection. All Copper includes 2003-2010 model units with standard beds and standard storage tanks. Additionally: Most Gold units have upgraded foam beds. Most Gold, Silver and some Copper have power or manual awnings. We are open 365 days a year. Our motor homes are available for rent all 12 months of the year. Winter: Mid September - April | everyday: 9 a.m. to 5 p.m.
Summer: May- Mid September | everyday: 8 a.m. to 6 p.m. When do I pick up and return the motor home? Pickup time is between 1:30 p.m. and 6 p.m.
Return time is between 8 a.m. and 10:30 a.m. Between 10:30 a.m. and 1:30 p.m., we clean, sanitize, and restock each motor home, and perform factory maintenance. Then we complete a safety inspection. On very rare occasion, a safety fix could cause your pickup time to be delayed. Because we always place safety first, we cannot guarantee exact pickup time. Do you provide shuttle bus service? We do provide a courtesy shuttle to and from your hotel, Ted Stevens Airport, and any other business location. For pick up please call us 1-800-421-3456 once you have all of your luggage ready. Please go to the cab stand on level one and take a cab to our location. Keep the receipt and we will credit the entire amount toward any travel accessories such as lawn chairs or fishing equipment. With each rental, we include the following insurance at no charge: $50,000 per person bodily injury liability up to $100,000 total; $25,000 property damage liability. The deductible is $2,500. Property damage covers damage while on a public road. Damage while off-road, such backing up in an RV Park, is not covered. Interior damage to the motor home is not covered. Collision Damage Waiver (CDW): $21 per day on Class C and $31 per day on Class A motor homes — $500 deductible, with $0 deductible for Class C windshield damage. Class A windshield 50% deductible. Inclusive Damage Waiver (IDW): $31 per day on Class C and $41 per day on Class A motor homes — $500 deductible will cover parking lot and off public road accidents, with a $0 deductible for Class C windshield damage. Class A windshield 50% deductible. We collect a $500 damage deposit in advance. If you return the motor home in the same condition as when you picked it up, we’ll send you a refund check within 10 business days of return. To avoid unpleasant surprises and eliminate extra charges at the end of your trip, we’ll shoot a walk-around video when you pick up your RV. What if I need to change the trip dates? If you need to shorten the length of your rental, please call us 30 days in advance of the original rental pickup date to avoid a $50 change fee. If you shorten your rental within 72 hours of the original rental pickup date, you will be charged a $75 change fee plus $45 for each day shortened. If you wish to add extra days your rental, you won’t be charged an extra fee beyond the cost of the daily rental rate. Cancelation fees are based on pickup date. You have a 24 hour grace period to cancel with no cancelation fee charged. Cancel between 0 days and 3 days prior to pickup - $500. We provide cancelation exceptions for medical emergencies. Or, at your request, you can apply 100% of cancellation fees to a future rental. When you make a reservation, a $500 deposit will be charged to your debit or credit card. On pickup day, we will collect the remaining rental fee. You can also prepay your rental up to 30 days in advance by check. If you choose to pay per mile, you’ll be charged for the estimated number of rental miles. Your $500 deposit becomes the damage deposit — see insurance section above about refund. We accept VISA, MasterCard, Discover, Diners Club, American Express, Cash and Traveler's Checks. The city of Anchorage collects a Rental Tax of 8% up to $240 per rental. The state of Alaska collects 3% of the total rental upon pickup. These taxes are added to the rental and are shown individually on our Rates Explorer web page. What do you offer to make our vacation more enjoyable? Housekeeping package - $16 per person. The housekeeping package includes cups, plates, paper towels, RV toilet paper and chemicals, hand soap, dish soap, trash bags, matches, sanitizer, kitchen towels, and a dish scrubber. We always have plenty of items in stock. You can reserve the above items upon making a reservation or upon pick up. Do you provide rentals from cities other than Anchorage? All other Alaska cities: $2.50 per mile. If you are arriving after 6:00 pm please take a taxi (taxi fare can be credit towards your extra items) over to our location, we are 4 miles away from the airport. Your motorhome will be sitting in our front parking lot waiting for your arrival with your name in the windshield. The keys will be in a designated location, please call for specifics. The motorhome will be set up for you to spend the night in and hooked up to electricity with water refresh service in the morning upon request. Please make yourselves comfortable for the evening. We open at 8:00 am and will be able to process your paperwork at that time and get you on the road at your earliest convenience. We have the option of you leaving the with the vehicle that same night even after we have closed our office. All we require is for you to contact us 30 days prior to your arrival so we can complete your paperwork ahead of time instead of in our office. If you are arriving after 6:00 pm please take a taxi (taxi fare can be credit towards your extra items) over to our location, we are 4 miles away from the airport. Your motorhome will be sitting in our front parking lot waiting for your arrival with your name in the windshield. The keys will be in a designated location, please call for specifics. The motorhome will be set up for you to leave our parking lot that same night. Should you choose to stay at our parking lot for the night we have electrical plug ins for you to plug your vehicle into and a water refresh service in the morning upon request. 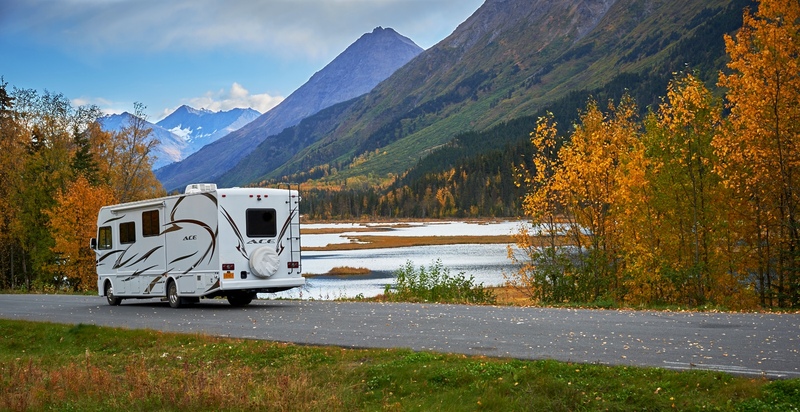 Travel comparison data indicate that on average, taking an Alaska vacation in a motor home is $100 per day less expensive than staying in hotels and eating in restaurants. When you travel with everything, including the kitchen sink, you save on food and hotel expenses. Alaska Campgrounds and RV parks are much more plentiful and interesting than hotels. You can't place a price on: being able to go places where there are NO hotels, avoiding unhealthy, poorly-prepared, expensive food in restaurants and bypassing public restrooms.